Supernova SN 2008D, seen visually in the galaxy NGC 2770 (right), 90 million light-years away, was spotted in the first few moments it began by the Swift satellite in the X-ray region of the spectrum (left). 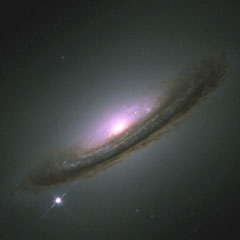 Supernova 1994D in galaxy NGC 4526. A supernova is the death explosion of certain types of star, resulting in a sudden, vast increase in brightness followed by a gradual fading. At peak light output, a supernova can outshine an entire galaxy. Most of the star is blown into interstellar space at speeds of several percent of the speed of light, eventually forming a supernova remnant. The classification of supernova is made on the basis of features in the spectrum of the exploding star. Behind these spectral differences are major differences in the mechanisms responsible for the explosion and the nature of the stars involved. Supernova are divided into Types I and II. Each of these types is further broken down: into Types Ia, Ib, and Ic, and Types II-L and II-C, respectively. Supernovae come in two main types: Type I, which lack hydrogen lines in their spectra, and Type II, which have hydrogen lines. These types are further subdivided. Types Ia, Ib, and Ic are distinguished by other details of their spectra. Types II-L and II-P are distinguished on the basis of their light curves: Type II-Ls showing a linear ("L") decline, while Type II-Ps remain on a plateau ("P") for a few weeks before falling off. Type Ia supernovae are the brightest of all, reaching a maximum absolute magnitude of -19. Types Ib and Ic tend to be a couple of magnitudes fainter, while Type II supernovae vary widely in their peak output. Type Ia supernovae occur in older populations of stars, such as those making up elliptical galaxies and the halos of spiral galaxies. Types Ib, Ic, and II are largely confined to the younger populations of stars found in the disks of spirals. In terms of the underlying mechanism of the explosion, Types Ib, Ic, and II have more in common with each other than they do with Type Ia. The latter is thought to occur exclusively in binary systems in which a white dwarf has acquired a large amount of material from its companion. When the white dwarf's mass exceeds the Chandrasekhar limit of about 1.4 solar masses, runaway carbon burning is triggered, which results in the incineration of the dwarf and the violent disruption of its contents. The other varieties of supernova are all thought to be due to the core collapse of massive stars. Types Ia and Ib involve stars that have lost their hydrogen envelopes, either through a powerful stellar wind or the transfer of material to a companion. Wolf-Rayet stars are considered likely progenitors of these kinds of supernovae, the slight chemical differences between types Ia and Ib arising from different degrees of stripping of the Wolf-Rayet's outer layers prior to the explosion. After a massive star has left the main sequence (see stellar evolution), it progresses to stage where it burns helium in its core, and then carbon. Each burning stage provides less total energy to the system and consequently lasts a shorter period of time. Carbon burning, which produces neon and magnesium, lasts around 100,000 years. When the carbon is gone, the core resumes its contraction and heats until the oxygen residue starts to burn producing silicon and sulfur – a stage that takes less than 20 years. Then in a week, the silicon turns to iron. The supergiant is now layered like an onion as each stage of nuclear burning moves outward in a shell around an iron core of nearly 1.4 solar masses. Iron, the most tightly bound of all atomic nuclei, marks the end of the road for a star since no energy can be gained from its fusion. Now the core is briefly supported by the pressure of electron degenerate matter. The density of the iron nuclei is so high that the electrons start to combine with them to form manganese, and the heat is so strong that extremely energetic gamma rays penetrate them and begin to break them back down into helium nuclei. Now that the electron degeneracy support and gamma-ray energy are gone from the interior, the core contracts faster and faster, then goes into a catastrophic collapse. The iron core flies inward at a quarter the speed of light. When the center of the incipient neutron star exceeds the density of an atomic nucleus, the inner 40% of the core rebounds as a unit. The outer core, still plunging inward, smashes into the rebounding inner core and rebounds in turn, generating a shock wave. In about a hundredth of a second, it races out through the infalling matter to the edge of the core. Modelers of supernova had then hoped that the shock wave would continue outward through all the layers of the star blowing it apart. However, calculations done by a number of theorists in 1989 suggest that in Supernova 1987A the shock didn't make it out of the core on its own. Neutrino emission may have provided the power that revived the shock. The core needed to contract even more before it could become a true neutron star and it did so by vast neutrino losses. The neutrinos were produced by the annihilation of electron-positron pairs made by the energetic gamma rays that pervade material at such high temperatures. The total energy emitted in the 10-second neutrino burst was enormous, about 250 times the energy of the material explosion. It is believed that a small fraction of these neutrinos revived the stalled shock and powered the great explosion of the star. Supernovae are the primary suppliers of heavy elements for the universe nucleosynthesis. Elements necessary for life, such as carbon and oxygen, as well as heavier elements like iron, are produced by nucleosynthesis within the star. In the explosive death of the star, these elements are thrown out so that they may be recycled by other stars and gases. The amount of heat and pressure released from a supernova explosion may create new regions of star birth by compressing the surrounding interstellar medium. In addition, supernovae are used as light beacons to measure cosmological distances. Important as they are, few supernovae have been observed nearby. The last one in our galaxy exploded in 1604 and was observed by Johannes Kepler before the invention of the telescope. The rate of supernova discoveries went up immensely with the onset of automatic searches that probe faint magnitudes.